No, you’re not really on Sunset Boulevard, but the LA icon was the inspiration for the makeover being celebrated this week in Terminal 6 at Los Angeles International Airport. Restaurants to look for include: Blu20 (L.A. beach-inspired cuisine), earthbar (fresh juices and salads), Habit Burger Grill, The Kitchen, WPizza, The Wine Bar, Osteria by Fabio Vivani (old-world Italian cuisine), Peet’s Coffee & Tea, Point the Way Cafe (craft beers), Wahoo’s Fish Taco and more. Shoppers will find a chic boutique from M. Fredric, TUMI and MAC Cosmetics shops, a See’s Candies store, a Belkin electronics shop, and plenty of places to pick up travel essentials. 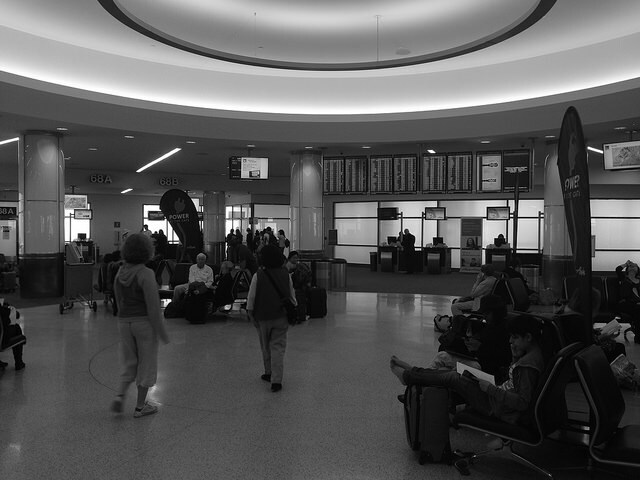 Here’s what the terminal spaces looked like before – followed by some more images shared by Westfield.